Krang interrupts the TV programs to announce that if Earth does not provide him with enough power for the Technodrome to return there, he will vaporize one square mile of the City within the hour. Krang has designed a Dematerializer using micro chips from an alien computer that Shredder found aboard a spaceship. While Rocksteady and Bebop are cleaning up the rest of the material form the spaceship, they discard an electronic keyboard that is somehow still conenected to the alien computer, through the Earth portal. The keybaord ends up in a secondhand store in the city. Howie Hardy, an out of work composer, and Irma are shoppping around for a keyboard for him and come across the one in the second hand store that came from Dimenxion X. They decide to purchase it. Meanwhile, the Turtles spot a portal opening from their portal activity detector. They think that this somehow connected with Krang’s plan so they set out to investigate. They discover that the keyboard is the object that came through the portal, but, they are too late because Irma and Howie have already left with it. Howie takes the keybaord home and starts practicing on it. Soon after playing it, the keyboard starts doing weird things. It is playing on its own. April, Irma and Howie don’t realize it, but the keyboard has somehow shut the Dematerializer off. Krang discovers what has happened and sends Shredder to destroy the keyboard. April sends for Donatello to see if he can fix the keyoard. When the Turtles arrive they discover that this is the keyboard they have been searching for. 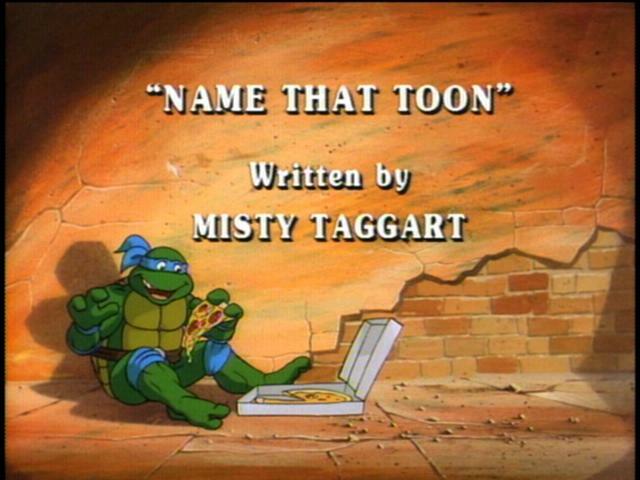 Shredder arrives at about the same time with Bebop and Rocksteady and they try to get the keyboard back. Somehow while all this is happening, Howie manages to turn the Dematerializer back on. Now it starts counting down from where it left off before. The Turtles realize they need to hook up the keyboard to something that will magnify the sound in order to stop the Dematerilizer permanently. Ater fighting off Shredder and company, the Turtles take the keyboard to the Channel Six News Building, broadcasting the music over the Channel Six transmitter and shutting down Krang’s Dematerializer for good.